July | 2014 | Welcome to the RW Carbon Blog! As you may assume installation difficulty can vary quite a bit depending on the product and application. This article will help guide you to what parts you can install yourself and what parts are better left to a professional. Many of our listings have brief installation guides, however if you ever have questions about how to install certain products do not hesitate to give us a call at 714.328.4408 or email us at info@rwcarbon.com. The majority of front lip spoilers range from a mild difficulty level to advanced and require two pairs of hands. These are attached using self taping screws, with some applications the use of 3M double stick tape is needed. If the lip spoiler is hollow then there will be indented spots on the bottom of some lip spoiler that will need to be drilled out before using a self taping screw. If the lip spoiler is single layered then you can just use the self taping screw, but pre-drilling is recommended. Trunk Spoilers are usually the easiest parts to install out of all the aero parts. Most spoilers only require 3M double stick tape and a good eye. Always test fit the trunk spoiler to make sure it fits perfectly, then apply generous amounts of 3M tape to the bottom, then carefully stick the spoiler on the trunk. Be careful to match the edges together and apply ample amounts of force to adhere the spoiler to the trunk’s surface. Depending on application, diffusers can be very tricky. 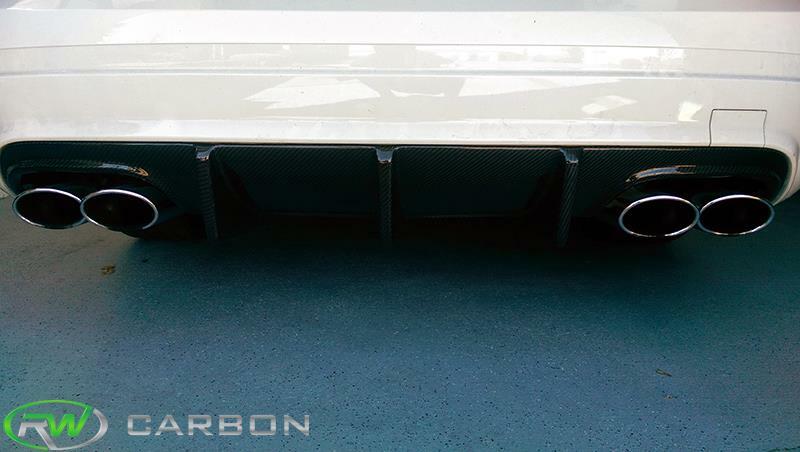 Some applications are more simple, like a BMW E60 M-Tech Rear Diffuser, where the new carbon fiber diffuser simply places over the existing one. On the other hand, some require the removal of the real bumper. Vehicles that come with an existing detachable rear diffuser like a Mercedes W204 C Class and C63 AMG or BMW F10 M5 will need the rear bumper removed to ensure the best fitment possible. The OEM diffuser can usually be taken off without bumper removal but the installation of the new diffuser normally requires it. Most of RW Carbon’s Diffusers have sturdy metal tabs on the back for easy adjusting and a strong mounting point. 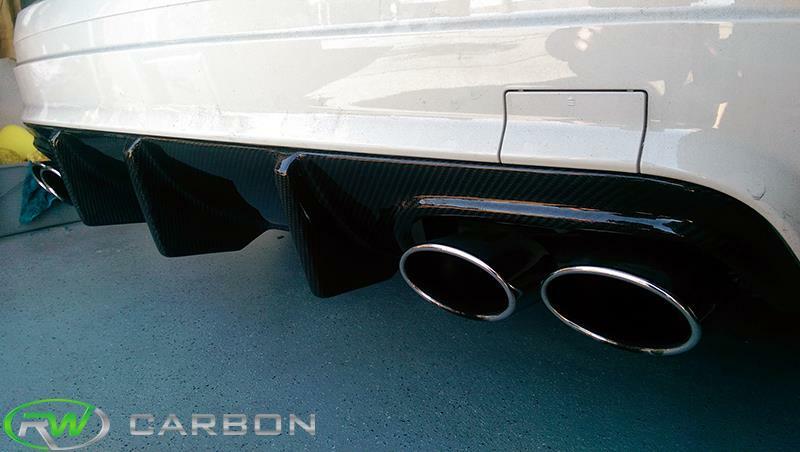 RW Carbon always highly recommends that our customers have their bumpers professional installed. We guarantee great fitment, but no car is exactly the same. Test fitting and adjust is always required. 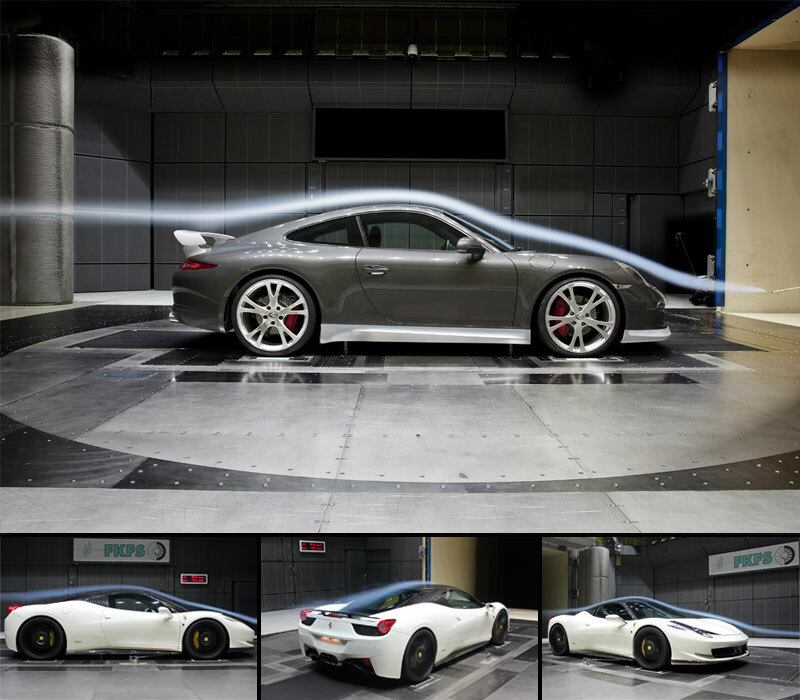 A professional body shop will know the tricks needed to get you the best fitment possible. Our bumpers will come raw, so prepping and painting will be required. Trunks and hoods are another item that we suggest professional installation. As mentioned above in the front and rear bumper section, each application varies small amounts. Each piece will require prepping, test fitting and adjusting for best fitment. Carbon fiber hoods and trunks can be left raw as the carbon is clear coated. Other FRP hoods and trunks will require painting. If there are any products you would like more information on how to install, please do not hesitate to contact us at 714.328.4406 or email us at info@rwcarbon.com. We received this review via MBWorld forum on behalf of AMGPower88. 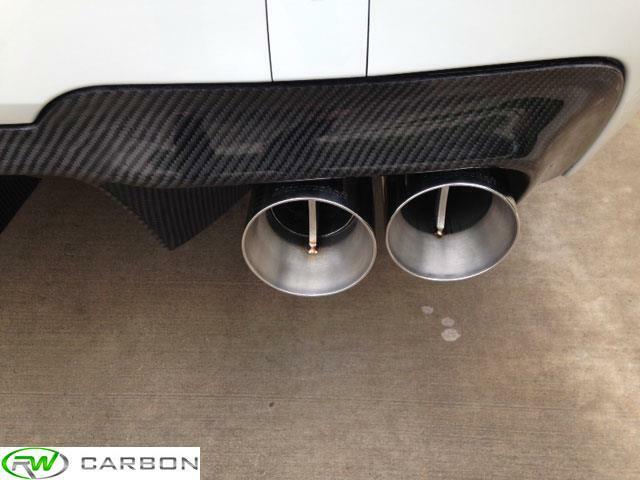 “So I received my pre-FL big fins diffuser from Matt at RWCarbon and it was packaged very well as expected. Shipping took a mere 2 days since Im located in California as well. Matt shipped out my diffuser as soon as I sent him the payment. Communication is spot-on, no confusion or hassle. Do Carbon Fiber Aero Parts Actually Make My Car More Aerodynamic? A quick answer to this question is yes! 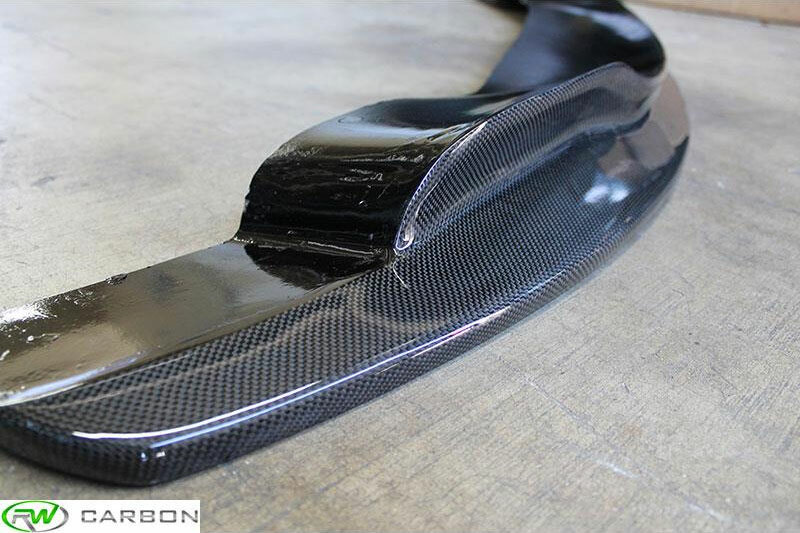 The majority of carbon fiber aero parts that RW Carbon carries actually add real aerodynamic characteristics to your car. When most people think of aerodynamics, they think less resistance applied to their car at a high of speed, while engineers will think of it in terms of a coefficient of drag. This is not always the case when it comes to all aero carbon fiber parts. Some parts like trunk lid spoilers and front lip spoilers can even increase the amount of drag that is applied to the car. However, this is a the kind of drag all racers yearn to have, and that is downforce. Downforce is a downwards thrust created by the aerodynamic characteristics of a car. The purpose of downforce is to allow a car to travel faster through a corner by increasing the vertical force on the tires, thus creating more grip. Plain and simple, downforce adds weight to your car, which helps to increase traction when you are pushing your car to its limits. 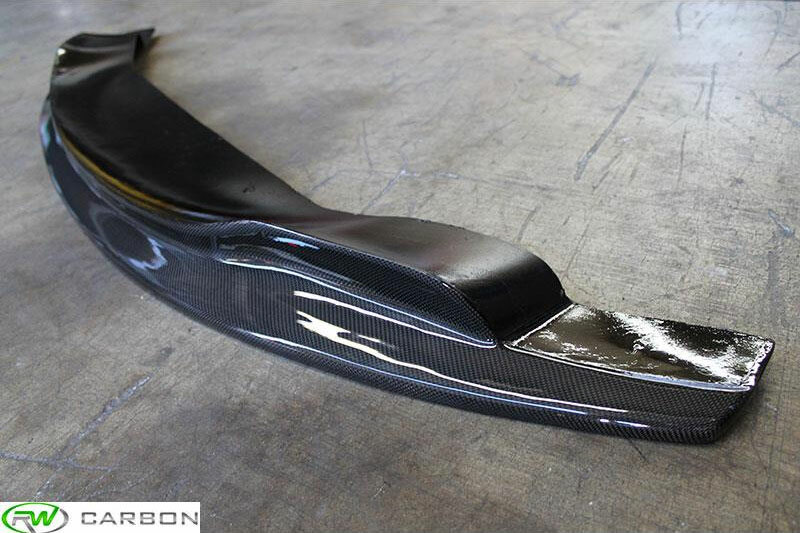 As engineers are creating these beautifully shaped carbon fiber aero pieces, they constantly have aerodynamics in mind. 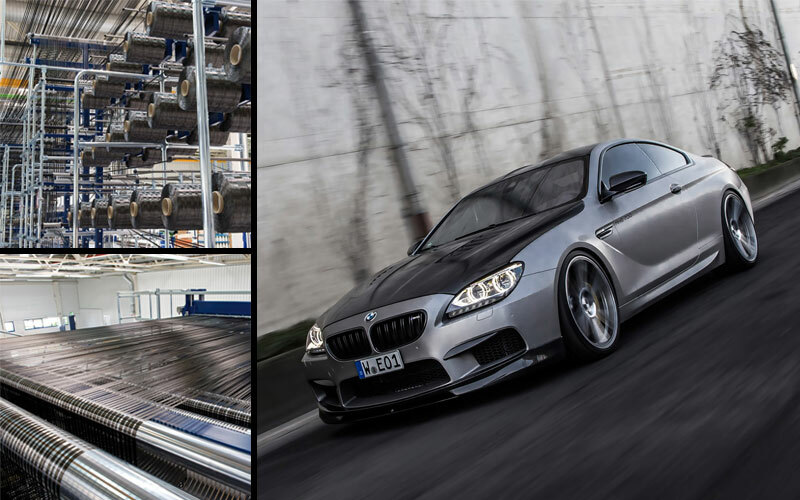 Many of these engineers that create carbon fiber aero pieces for every day cars like Audi, BMW, Mercedes and Volkswagen have their roots in the racing industry. Each piece from splitters to roof spoilers are shaped to create the perfect balance of downforce, while still keeping the car aerodynamically stable. Not to say that all carbon fiber aero parts are balanced perfectly, but the majority of high end pieces are designed with looks and full functionality in mind. 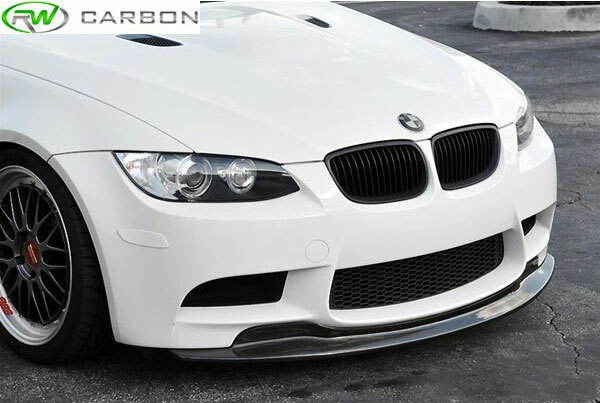 For those M3 owners that are looking for a unique appearance upgrade that maintains a factory look – Check out this BMW E9X M3 GTS Style Front Lip. RW Carbon now has these lips in stock and ready to ship out! Link on the link to learn more or contact us by phone: 714.328.4406 or email: info@rwcarbon.com. 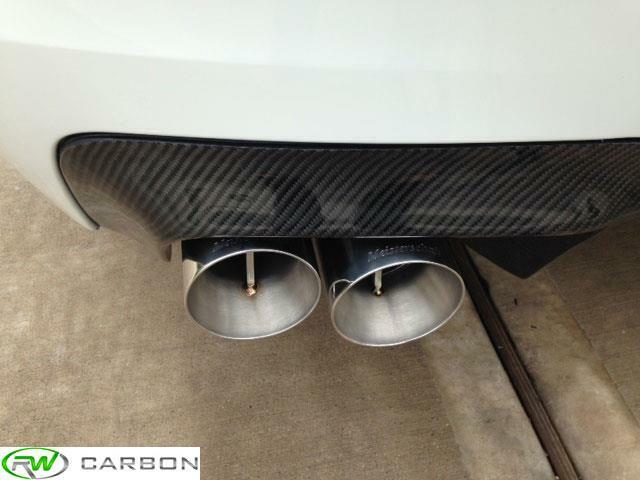 Our BMW F10 M5 DTM Diffuser – Installed! 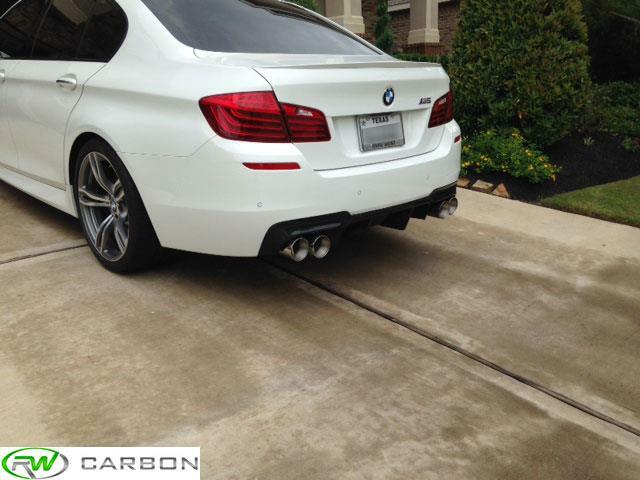 We just got some great pictures back from a customer of ours from the M5Post who installed our F10 M5 DTM Style Diffuser on his Alpine White BMW F10 M5. Check out the pictures below. What do you think of that diffuser paired up with a roaring meisterschaft exhaust? What is Carbon Fiber, and what makes it so special? Carbon fiber originated for aerospace use, but as it has become more usable this material expanded into the automotive industry. It has several properties that make it a superior product for so many automotive applications. Properties such as high rigidity, tensile strength, chemical resistance, temperature tolerance, and with a low weight and thermal expansion. Carbon Fiber is a material that consisted of thousands of carbon atom fibers in diameters of 5 to 10 micrometers. 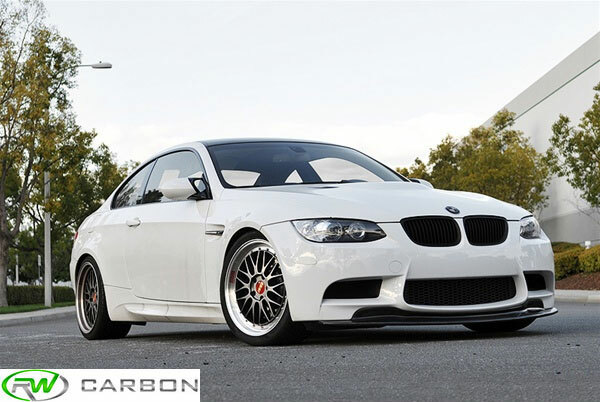 In order for RW Carbon to produce carbon fiber products like front lip spoilers, rear diffusers, trunk spoilers, trunks, hood and many more, the carbon atom crystals must be bonded together in a symmetrical and parallel pattern. This alignment gives the carbon fiber its strength and the ability to be lightweight. Thousands to millions of these carbon fibers are bundled together to form carbon fabric. From there a mold must be made of the desired aero piece. In order to form your favorite carbon fiber parts and accessories, resin must be added to the carbon fabric and then molded. When a perfect mixture/ratio of carbon fabric and resin is used the parts become extremely rigid and take on a very high strength-to-weight-ratio. Every carbon fiber aero part that is designed has its own special number of layers of fibers to create a perfect ratio of strength, weight and stiffness. This is why carbon fiber is so limitless when it comes to the design aspect. Metal on the other hand is more limited on the shape it can provide. Carbon fiber composites typically weigh a quarter of the weight of steel, but has the same amount of rigidity, making it 4 times as stiff on a weight-to-weight basis.